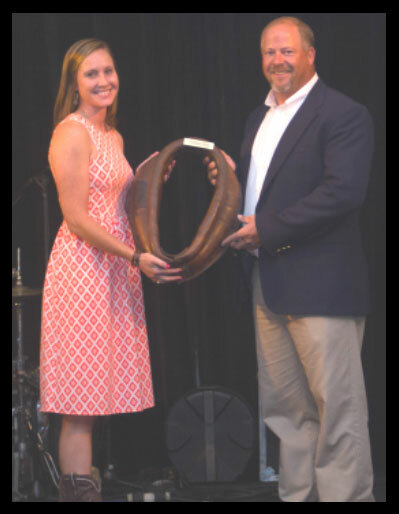 The Work Horse of the Year recognition for 2018 was awarded to Chynette Todd on Aug. 4th during the Annual Meeting in Nashville. Chynette has served on the TPA Board of Directors since 2008 and was President from 2015-2017. She continues to serve on the grower committee, auction fundraising committee, nominating committee and executive committee for TPA as the interim secretary/treasurer. Very notably, Chynette coordinates and heads up the sporting clays events for our spring scholarship fundraisers and annual meetings, which continue to grow in success each year. She has been very instrumental in the success of the auction fundraising efforts over the years as she is very involved with their planning and execution. Chynette moderates the silent auction during the annual meeting and brings excitement and organization to such a great evening. immediate past president Scott Black stated that Chynette Todd is inarguably the most passionate and enthusiastic when it comes to TPA and it has shown through her actions and dedication over the years. She has always thrown out ideas and has always challenged the way we thought and how we conducted business. 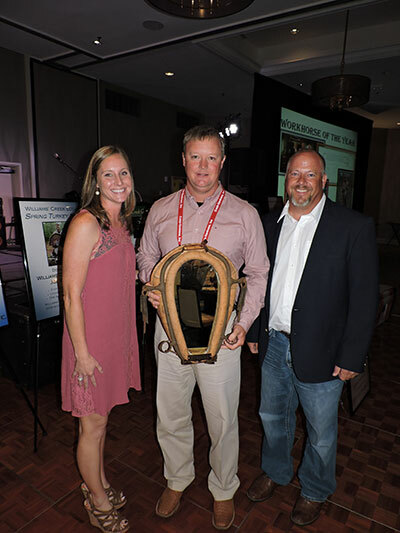 TPA's 2017 Workhorse recipient Shane Joyner, and the 2016 Workhorse recipient Scott Black, made the special presentation to Chynette, with TPA Board member Bart Smith moderating. Just recently employed by SunCoast Pine Shavings, and additionally self-employed with CT Consulting, Chynette and her husband Andy live in Cookeville, TN along with her daughter, Aubrey. Congratulations Chynette, and many thanks from TPA for your dedication and many contributions! TPA's Workhorse of the Year was awarded to an individual who has been involved in almost everything that TPA has ever done since he has been involved with TPA. You don't have to be around this person very long to know that he is a very talented individual who has really served TPA above and beyond what we could ever ask of him. He is a wealth of knowledge and is full of great ideas and solid advice. He is the person that we often turn to in making best decisions for the association. Not only did Jay Daniels jump right in to begin serving as the Secretary/Treasurer when he became a board member in 2010, but he has helped tremendously to bring in new sponsors, new allied members and support for the various fundraisers. Most notably, Jay has contributed most significantly in helping to set up and establish the TPA office in Shelbyville in 2012, and to get the accounting procedures and budget in place that is working so well for our association today. He worked very closely with staff at that time, and he took the time from his busy schedule to work with them in person and at the office until all was running smoothly. Jay was also directly involved in the interviewing process when we hired Tracy in Nov. of 2013, and we all know what a great decision that has been. Jay has been Director of Operations for the Americas since Oct. 2006 for Hubbard, LLC in Pikeville and he has served on Hubbard's Global Management Committee. Additionally, he has served as past-Chairman of Hubbard Farms Charitable Foundation and he continues serving as a trustee. Moreover, Jay has served as a Board member for the US Poultry & Egg Association, and he is the current Chair of the Pikeville-Bledsoe Co. Chamber of Commerce. TPA proudly recognizes Jay Daniels as our 2017 Workhorse of the Year - he's certainly a man that gets things done and takes pride in everything that he does. We additionally look forward Jay's leadership and continued wisdom as our next President for 2017-2019, and the level of energy and excitement that he brings to the association. Shane Joyner, Live Production Manager for Tyson Foods in Obion Co., came onto the TPA Board a year ago and has been doing amazing things for the Association ever since. Not only did he jump right in to begin serving as the Secretary/Treasurer, but he has helped tremendously to bring in new sponsors, new allied members and auction items for the fundraiser. Shane has been very active on TPA's Live Production Committee in planning the grower meetings and in lining up speakers. He additionally has been very aggressive in lining up plans and commitments for the proposed broiler research house to be built at TN Tech University, and he has been working closely with the Ag program at UT Martin to promote poultry industry opportunities for their students. 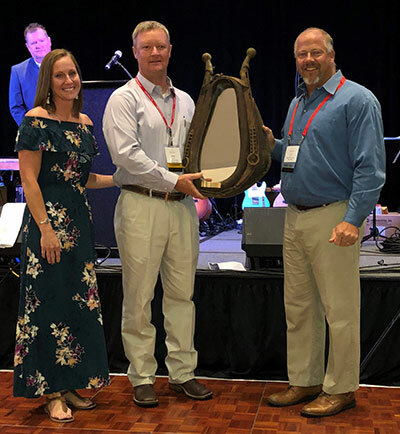 Shane has additionally, and amazingly, had the winning TPA Farm Family of the Year nomination under his leadership for the Tyson Obion complex four of the seven years that TPA has been awarding this recognition. TPA proudly recognizes Shane Joyner as their 2016 Workhorse of the Year - he's certainly a man that gets things done.